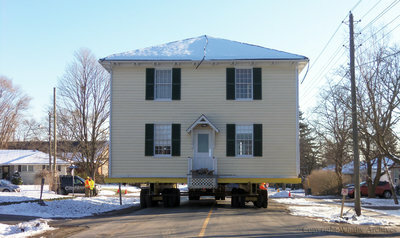 A colour photograph of the Jabez Lynde House being moved to its new location on the southwest corner of Brock and Burns Streets. This photograph is of the side of the house as it moves down Cochrane Street. Relocation of the Jabez Lynde House, November 2013, Pam Neilly. Whitby Archives D2013_013_003.